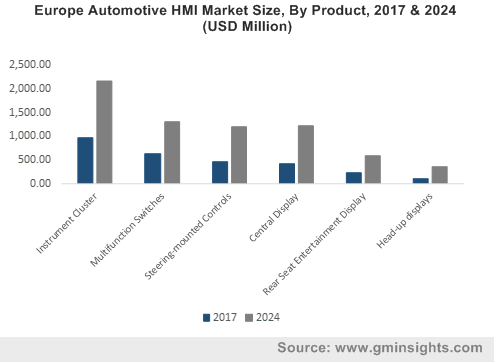 Automotive HMI Market size was estimated at over USD 11 billion in 2017, growing at a CAGR of over 12% between 2018 to 2024. 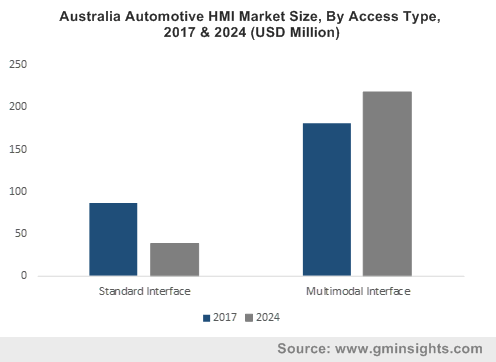 The automotive HMI market is projected to exhibit an excellent growth between 2018 and 2024 due to the rapid technological advancements in Augmented Reality (AR), Virtual Reality (VR), and IoT and their incorporation into HMI solutions. Also, with the growing emphasis by Original Equipment Manufacturers (OEMs) and aftermarket service providers on incorporating gesture recognition and voice-based interface technologies into modern HMI solutions, the demand for these products is likely to accelerate over the forecast period. The integration between the infotainment head unit and the cluster is expected to be the next major trend on the hardware side. Many companies are focusing on enhancing the connectivity between different HMI components to alleviate the driver experience while ensuring an enhanced driver safety. Instrument clusters are expected to hold a significant share in the automotive HMI market throughout the forecast period while registering a CAGR of over 10%. A growing trend among automotive manufacturers to develop fully digital and 3D clusters is expected to further support the market growth. Digital clusters enable the display of critical information that enables the analysis of the current situation by the driver for making informed decisions. The steering-mounted control segment is projected to exhibit a robust growth with a CAGR of over 13% between 2018 and 2024. The introduction of these controls in the mid-segment passenger vehicles has been highly appreciated by the buyers and automakers are focusing on providing them with an enhanced infotainment experience by modernizing steering-mounted controls to incorporate more functionalities. Visual interfaces are projected to hold a majority share in the automotive human machine interface market due to the growing trend among the market players on developing innovative display systems and increasing uptake of touch-screen display panels in the middle as well as lower segment passenger cars. Also, with the growing popularity of Organic Light Emitting Diode (OLED) display technology to enable thinner and more efficient displays compared to LCD displays, the visual interface market is expected to register a robust growth during the forecast period with a CAGR of over 12%. The passenger vehicle market is projected to account for the majority share of around 80% in the global automotive HMI market by 2024. 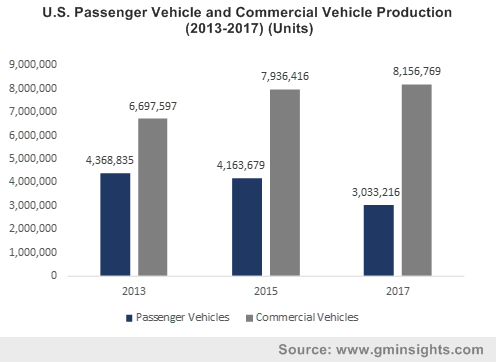 The increasing production of passenger vehicles around the world coupled with rapid technological advancements in HMI systems targeted toward the passenger vehicle segment is expected to facilitate market growth during the forecast timeline. In 2017, the global automotive industry produced 73.5 million passenger cars with China, Japan, Germany, and India being the major producers. China was ranked as the largest producer of passenger cars in 2017 having manufactured more than 24.8 million cars. The multimodal interface market is projected to hold a majority share of over 50% in the automotive HMI market by 2024. The excellent market growth is attributed to the increasing trend of developing multimodal interfaces to incorporate haptic and acoustic interaction capabilities into HMI systems. Traditional interface components such as hard push buttons, rotary controls, and warning lights are being replaced by multi-modal input methods such as gesture control, voice control, touch screen, and haptic feedback. The trend has been initiated by the rising demand for these features in the luxury passenger vehicle segment. 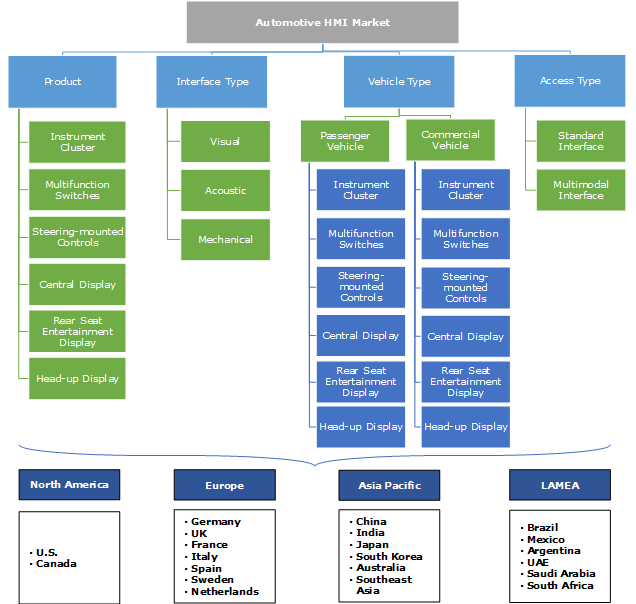 North America Automotive HMI market is projected to register a lucrative growth with a CAGR of over 15% during the forecast period due to increasing investments by major automotive companies for the development of autonomous cars, increasing adoption of automotive IoT, and a consistently growing demand for luxury passenger cars in the region, especially in the U.S.
Europe held the second largest share of over 20% in the global automotive human machine interface market in 2017. Due to the presence of a large number of major luxury and passenger manufacturers such as Volkswagen, BMW, Porsche, and Audi, the innovation in the HMI landscape is expected to accelerate swiftly over the forecast timeline. The companies operating in the global automotive HMI market are focusing on new product development and product innovations to design and commercialize advanced HMIs for enabling a higher degree of interconnectivity among different HMI components. In line with this strategy, these companies are collaborating with each other for leveraging their mutual expertise. For instance, in December 2017, Denso Corporation, one of the leading providers of innovative HMI solutions, collaborated with BlackBerry Limited to develop an integrated HMI platform. The platform developed using BlackBerry’s QNX Hypervisor for virtualization along with the Intel Atom processor A3900 series, enables different HMI products to cooperate with an appropriate timing for enabling a timely response. Some of the key players in the automotive human machine interface market are Continental, Harman, Alpine, Magneti Marelli, Altran, EAO, Clarion, Nuance, Denso, Socionext, Tata ELXSI, Valeo, Visteon, Yazaki, Bosch, Panasonic, and Luxoft. Through the years, the automotive industry has witnessed an evolution of HMIs from dashboards with only essential HMI components to digital clusters offering a wide range of instruments and functions. Vehicle manufacturers are emphasizing on integrating innovations into their models to make them safer, more entertaining, more attractive and simply fancier. With increasing R&D in autonomous vehicles, smart navigation, and telematics technologies, the automotive human machine interface market is anticipated to register a robust growth over the forecast period.